Madison Blair McDonald and Matthew Harrison Hamner were married June 23, 2018, at 6:30 in the evening at Stonewood Farms in Tuscaloosa with Tony Reynolds officiating. The reception followed at The North River Yacht Club in Tuscaloosa. The bride is the daughter of David and Marla Smith, of Town Creek, and Brian McDonald, of Muscle Shoals. She is the granddaughter of Norma McClure and the late Kenneth McClure, of Muscle Shoals. The groom is the son of Mike and Lori Reynolds, of Maplesville, and Max Hamner, of Tuscaloosa. He is the grandson of Jerry and Peggy Harrison, of Maplesville, and Mildred Sutton, of Tuscaloosa. 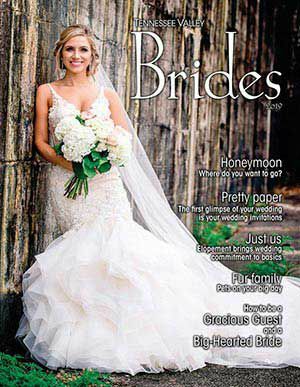 The bride’s Randy Fenoli gown, along with her veil and headpiece, were purchased from The Something Blue Shoppe. She wore earrings from usabride.com and shoes by Badgley Mischka. Maid of honor was Abbey McDonald, sister of the bride. Bridesmaids were Morgan Hamner, sister of the groom; Caitlin Martin, Carley Franks, Hannah Hollis, Samantha Yeager, Allison White, Kailee James, all friends of the bride. Junior bridesmaids were Gracie Smith and Ansley Smith. Flower girls were Rayne Henry, Aspen Henry, and Blakely Butler. Best man was Hunter McCay, cousin of the groom. Groomsmen were Kyser Smith, Max McDonald, brother of the bride; Joe Hallahan, Bob White, Jared White, Cody Jones, Dawson Thomas, all friends of the groom. Ring bearers were Hudson Matthews and Waylon Dixon. Wedding director was Jennifer McGuire. Floral designer was Christi Patton. The reception was catered by the venue, The North River Yacht Club. The wedding cake and groom’s cake were made by Jan O’Donnell of Wedding Cakes by Jan. Reception décor was made by Nikki Koch. The bride’s hair and makeup were done by Lauren Vining Hunter and the bridesmaids were done by Madeline Hulsey. Photographer was Heather Sherrill of Create Portraiture and videographer was Lance Holloway of Holloway Productions. The groom’s grandfather is a peach farmer from Chilton County, Alabama so the groom chose to do his groom’s cake table theme in peaches. When the night was over, the bride and groom jumped in the pool of The North River Yacht Club in their wedding attire. After a honeymoon at Sandals Emerald Bay in Exuma, Bahamas, the couple is now residing in Maplesville, Alabama. Jordan Faith Ellis and Ronald (Ron) Fletcher Crow, Jr.